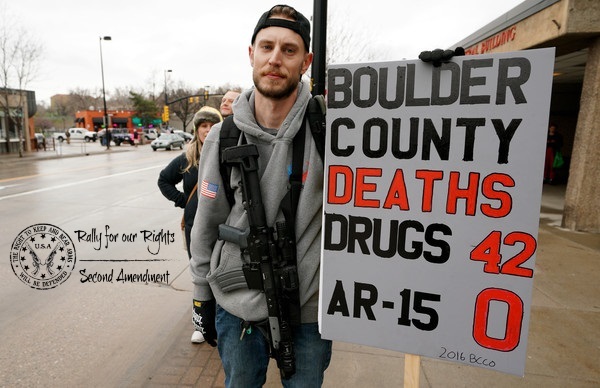 Rally for our Rights has been at the forefront of Boulder, Colorado’s so-called “assault weapons” ban since it’s inception. We attended city council meetings and organized messaging campaigns encouraging residents to contact their local government officials. We organized a street demonstration on April 21st, 2018 in protest to the proposed ban – an event which was attended by hundreds in the heart of Colorado’s most progressive city – even in the rain/snow. There were threats of lawsuits against Boulder, one of which came to fruition less than 24 hours after the ordinance passed, and another quickly followed. Despite these efforts, the Boulder elites who make up the city council voted unanimously on May 15th, 2018 to ban the sale and possession of many semi-automatic rifles, pistols, and shotguns as well as bump stocks and magazines holding more than 10 rounds. This unconstitutional move did nothing to address actual crime, but instead criminalized and demonized the law abiding. As part of this ban, residents who owned any of the prohibited firearms prior to the day the ban went into law (June 15th, 2018) can participate in the city’s “This-Is-Not-A-Registry” program and grandfather their guns with a certification. 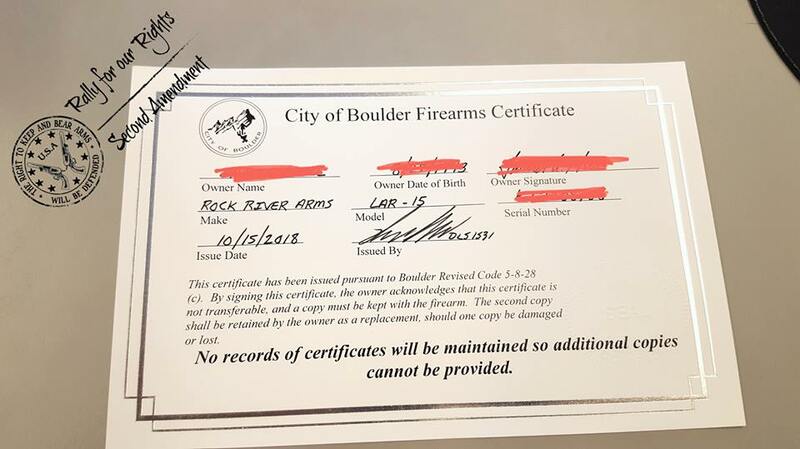 The last day to certify a firearm is supposed to be December 31st, 2018, but Boulder Police have stated that due to the holidays, the last day will actually be December 27th. The complete ban will officially take effect on January 1, 2019, at which point possession of a banned weapon without a certificate will be punishable by 90 days in jail and/or a $1,000 fine, and firearms will be confiscated and destroyed. The certification process involves taking the firearm(s) being certified to the police department (unloaded and secured in vehicle) where they will be inspected. You must have a valid photo ID and a new background check will be run. If the the background check comes back clear, two certificates per firearm will be issued. The cost is $20 for the first firearm and $5 for each additional firearm. Gun owners must then keep the certificate with the firearm at all times – forever – otherwise they’re a criminal. Lose this piece of paper? The firearm can be confiscated. Don’t comply? Criminal. Allegedly there are no copies of these certificates kept. According to Boulder Police Department, they have certified 85 firearms so far. 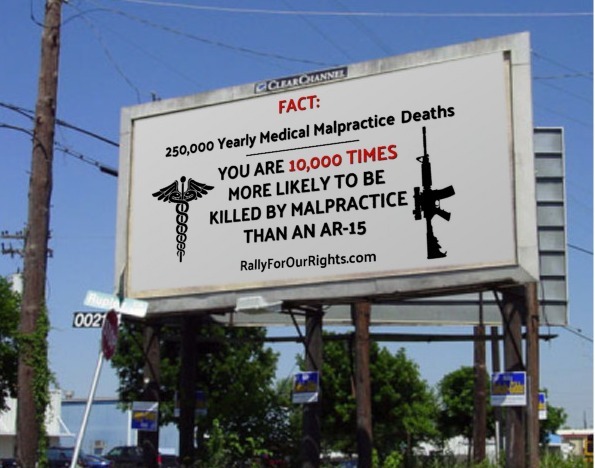 Now, let’s make this clear – this is not 85 gun owners, this is 85 firearms. Each prohibited firearm needs it’s own certificate. With the average gun owner possessing eight firearms, it is likely less than ten people have actually complied. But this begs a question – if they aren’t keeping records, how do they know how many certificates have been issued? According to them they are keeping a handwritten tally. A handwritten tally of how many law abiding gun owners are certifying their firearms, because we know the people we should actually be concerned with aren’t certifying theirs. Then we had to ask how many bump stocks or magazines above 10 rounds have been turned in? You guessed it, ZERO. 1.) All semi-automatic center-fire rifles that have the ability to accept a detachable magazine and have a pistol grip, telescoping stock, or off hand stabilization feature. 2.) All semi-automatic center-fire pistols that have the ability to accept a detachable magazine other than in the pistol grip or has any other secondary stabilization feature. 3.) All semi-automatic shotguns that have the ability to accept a detachable magazine, or have a fixed magazine over 5 rounds, or have any secondary stabilization features. Read the “assault weapons” ban ordinance in it’s entirety here. And read the bump stock/magazine ban ordinance here. One of the most common questions we receive is how is this legal, and if it has been challenged in court. It is not legal, and it is being challenged in court. The day after the ordinance passed into law, Mountain States Legal Foundation filed a suit in federal court. Not long after, the NRA filed a suit in state court. The federal suit is on hold until the state suit is decided. Boulder is claiming because it is a home rule city, it is not beholden to the state constitution or state laws. If this is the case, we have to wonder if more gun friendly home rule cities can claim the same, and exempt themselves from Colorado’s magazine limits and enhanced background checks. Your move, Colorado courts. Here’s What Boulder, CO Is Making Gun Owners Do! A Boulder, CO resident who had their firearm “certified” under the city’s new “assault weapons” ban brought this to us. We’ve been wanting to see one but not many people are interested in registering their firearms. In order to be part of Boulder’s “This-Is-Not-A-Registry” program, anyone who owned one of the banned firearms prior to June 15th, 2018 must go to the police department and have it “certified” before Dec 31st, 2018. They must then keep the certificate with the firearm at all times – forever – otherwise they’re a criminal. Lose this piece of paper? The firearm will be confiscated. Don’t comply? Criminal. Allegedly there are no copies of these certificates kept.